Hurricane Maria arrived hot on the heels of Hurricanes Harvey and Irma, inflicting a record amount of damage upon Puerto Rico and the US Virgin Islands. As the third in this line-up of storms, Maria was also the deadliest, causing catastrophic damage and numerous fatalities across the northeastern Caribbean, and compounding recovery efforts in areas already struck by Hurricane Irma. Recovery is still underway and will span years if not decades. Good360 mobilized our response immediately after the hurricane struck and is still on the ground responding to the evolving needs of survivors. Good360 is working with organizations across the private, public and nonprofit sectors to ensure products are delivered when and where they are needed most. 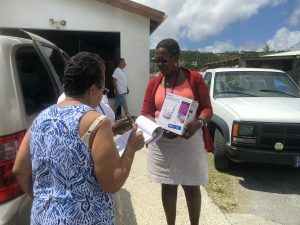 Recently, Good360 helped facilitate a huge collaborative effort between FEMA, two USVI nonprofits and a wide variety of donors to deliver product to residents on the islands of St. Thomas and St. Croix. FEMA reached out to Good360, outlining a number of goods that were needed by nonprofits on the ground. Prior to that, Good360 had been prestaging product from donors such as The Home Depot and CVS in preparation for the needs that arise after a disaster and many of those goods aligned with the needs on the ground at that time. The two organizations that received the product were Perfect Heart and St. Croix Christian Church (SCCC). Perfect Heart operates on St. Thomas while SCCC serves St. Croix. Both nonprofits received items such as Burt’s Bees baby wipes, Red Wing coveralls, Scotch Corp gloves, 3M duct tape, and The Home Depot shop VACs and air compressors. 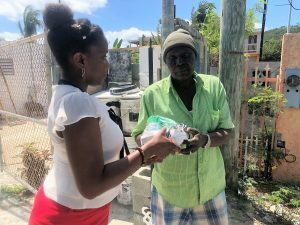 The items were distributed to members of the community who were affected by the storm and who are in desperate need of everyday items that they no longer have easy access to. Collaboration in the disaster field is critically important to delivering the right goods to the right people at the right time throughout the recovery process. Good360 is dedicated to fostering collaboration on the disaster field and being a leader in effective response. 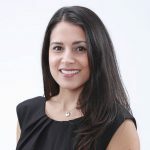 Working with entities such as FEMA and connecting the response of multiple organizations is key ensuring that the right people are receiving the right products at the right time.